Need private piano lessons with a capable, experienced Niagara Falls piano teacher? Niagara Falls piano teacher, Jan Jaluvka, gives private piano lessons at Jaluvka Piano School in Niagara Falls, Ontario, Canada. Jan is an accomplished pianist who established Jaluvka Piano School in 1999 in order to provide piano instruction in the Niagara Falls-Chippawa-Fort Erie area. 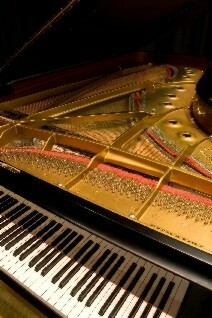 Our focus is on building strong piano technique, developing high performance skills and cultivating the innate musicality in each of our students. We provide private piano lessons to students of different ages, from beginner to advanced levels and generally follow The Royal Conservatory of Music (RCM) curriculum. However, we do offer lessons in a less-structured format to accommodate the needs and interests of those wishing to pursue their own particular individualized musical objectives. We possess considerable expertise and experience in preparing students for RCM Piano Examinations and our students have achieved excellent results in these exams. They have also earned numerous awards, honours and distinctions in various piano competitions. All lessons are given on a 7 foot semi-concert grand piano in a bright, spacious setting conducive to relaxed concentration and creativity. As an experienced piano teacher, Jan has observed the many positive benefits students gain from learning to play the piano. He is firmly convinced that a good music education plays an integral part in a student’s broader education and character development. To this end, Jan works closely with his students to utilize and build upon the unique intellectual and personality strengths which each individual student brings to the keyboard. Copyright © 2010 - 2018 Jaluvka Piano School. All Rights Reserved.